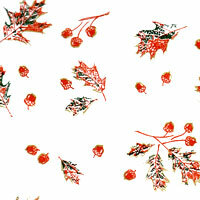 Acorns and Maple Leaves Cellophane Roll 24 inches wide x 50 ft long. Orange-Brown, hunter green and gold leaves and acorns. Cello background is clear. Beautiful design for the fall. Place a cellophane runner on your dining room table for a festive look for the holidays. This is the perfect gift wrap for those gift baskets or odd shaped gifts.